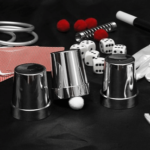 Want to learn how to do the cups and balls magic trick? Today I’m going to be explaining exactly how you can learn this awesome magic trick with nothing but a few plastic cups, some foil, and YouTube! No need to cash out hundreds on fancy tutorials, we’ve got you covered. This trick is a classic of magic. Some people say that it goes as far back as the Egyptian days (apparently there’s even art of Egyptian magicians performing it…although I don’t know how true that is). EDIT: I quickly checked up on the cups and balls within Wikipedia and sure enough, apparently there is a piece of art from way back in 2500 B.C (around 4500 years ago) of Egyptian magicians kneeling over ‘four inverted bowls’. That would probably make this (literally) the oldest trick in the book. There are a ton of different versions of this trick, but my personal favorite is the Penn and Teller Cups and Balls. Because they do it with SEE THROUGH cups. Don’t get me wrong; I love the ‘classical’ approach to the cups and balls too, but there’s just something hilarious about these two professional magicians doing something so ridiculous as a magic routine in which the whole premise (you shouldn’t be able to know where the ball is) is completely undermined (you see everything). However, it still works brilliantly as an effect. Here’s the 4 steps you’re going to need to take. You can go about this in two ways. 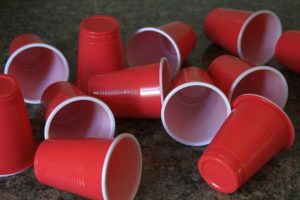 You can either buy an ‘official’ cups and balls set with perfectly weighted and shaped cups, or you could just grab a couple plastic cups for a quid each from your local store. If you’re still fairly new to magic than I would recommend staying away from big purchases like a custom copper plated crafted set of cups (that’s a thing) and go cheap for the time being. If you really enjoy this trick and get the hang of it quickly than you should probably consider paying out- but for now it’s better safe than sorry. The balls are the same scenario; buy a ‘proper’ set or just find something of a similar weight (remember, Penn and Teller used foil, so I wouldn’t stress about this bit too much!). You could even buy some sponge balls so you can use them for both this trick and a sponge ball magic trick! Once you have your cups and balls, you’re ready to go. Step 2: Rewatch the Penn and Teller performance, a hundred times. There’s a reason I chose to talk about the Penn and Teller version of the cups and balls, a super convenient one actually. The fact that they use see-through cups mean that you can learn the entire routine for free simply by rewinding and rewatching what they do and when. Of course, it isn’t as simple as that and as you watch you’ll realize just how fast they can do this trick (they’ve had a lot of practice…). It’s also about the misdirection; manipulating the audience to look away from the hands at key points. I personally was able to put all the pieces together after rewatching this performance enough times, but I must admit it did frustrate me at times. So don’t worry! If you don’t understand certain bits, it’s not the end of the world. Grab yourself some cups and balls. Rewatch the Penn and Teller performance to see what moves are required and when. Rewatch the Penn and Teller performance. And so on…until you have all the necessary sleights memorized and can go through them in your sleep. Step 3: Film yourself doing the cups and balls. This step is absolutely VITAL. Before you’re ready to go out and stun the world with your skills, you need to make sure you know all your angles and how it currently looks. 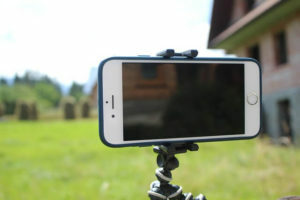 The first is to use a mirror; just a standard mirror will enable you to see how your sleight of hand and handling looks from the point of view of a spectator. However, mirrors aren’t perfect. You won’t be able to see exactly how it looks because you won’t be looking at the mirror the whole time (or at least, it would be very difficult to only look at the mirror) and there’s a chance you might miss important bits. That’s why I always recommend recording yourself and watching the video back when you’ve finished. You can pause and rewind as much as you like to really break down what you can do to improve and which bits are going well. Chances are that as you watch yourself doing the trick, you’re going to notice a few areas for improvement. That’s great. Now go and practice the bits you messed up and record yourself again! As you continue this cycle (record yourself, spot areas for improvement, practice!) you’ll gradually get better and better until you’re finally ready to perform. There’s definitely a difference between being able to do this trick in front of your mirror and in front of a real live audience. It’s completely normal to feel nervous before performing, so don’t worry about it. Just remember all the practice you’ve done; you’re definitely ready to go. To make sure you’re ready to perform, you need to have developed a solid performance or ‘patter’ (what you’re going to say) for this trick. For example, you could do it like Penn and Teller; comedy style. Or you could go for a serious approach and really try to fool them! You could even mix it up a bit and make your own magic trick up using the techniques you’ve learnt. Make sure you have a really clear performance mapped out so you don’t freeze up when you do it for real. Try planning out what you’re going to say (you don’t particularly need to memorize anything, just have a rough outline of the kind of thing you want to say). Once you have a performance style and patter planned, you’re ready to go! I hope you enjoyed this tutorial. If you have any feedback about it, feel free to leave me a comment in the comment section below or get in touch with me using the contact form right at the bottom of the page. If you found this useful, then make sure to share it with your friends using the social icons to your left (or bottom of the screen if you’re on mobile). 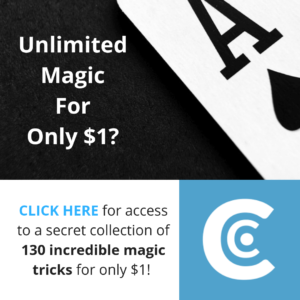 Have any more questions on how to learn the cups and balls magic trick? Leave a comment! Enjoy learning this trick? 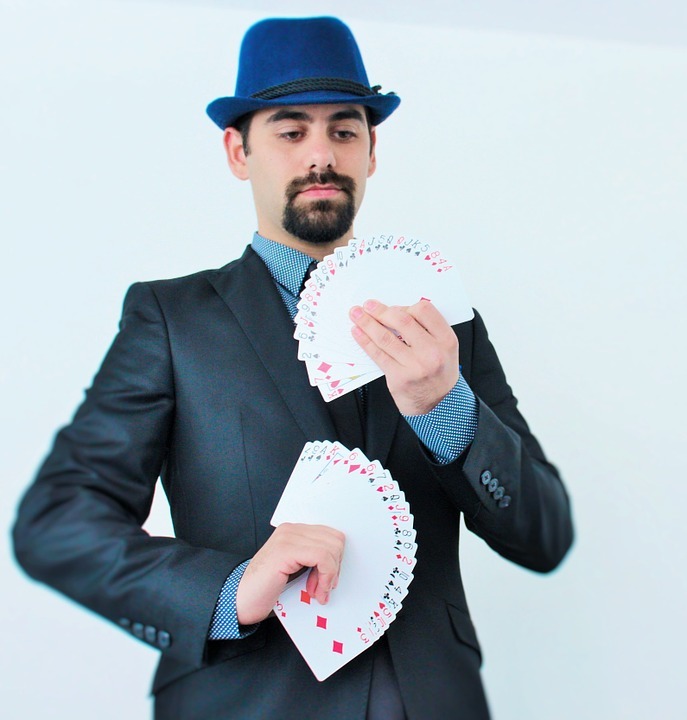 Why not check out some of my other magic trick tutorials?